Probably the most recognizable constellation in the winter sky, Orion contains a collection of famous and prominent deep sky objects. The constellation is named after the hunter Orion, and it bears an uncanny resemblence to the outline of a man. This image has Orion on his side with his head to the left and feet to the right. In the center of the constellation, the stars Mintaka, Alnilam, and Alnitak form the famous Belt of Orion, while to the right of the belt is a collection of nebulae outlining Orion's Sword. The red supergiant Betelgeuse marks Orion's right shoulder, blue Bellatrix denotes his left shoulder, the hot blue supergiant Rigel is placed at Orion's left foot, while fainter Saiph identifies his right foot. In this image, M42, the Great Nebula in Orion, is at the bottom of Orion's Sword (right side of image). The emission nebula, M43, is immediately to the left of M42 with the blue Running Man reflection nebula left of M43. Extending below Orion's belt (towards the right) is a red hydrogen nebula (IC 434) which has dark dust blocking its light to form the Horsehead Nebula (Barnard 33). Below Orion's belt is the peach colored emission nebula known as the Flame Nebula (NGC 2024), which looks like the outline of a leaf. At the top right of this image is the blue Witch Head Nebula (IC 2118), which shines by reflecting light from nearby Rigel. The large red semicircle on the bottom of the image is the faint emission nebula Barnard's Loop. At the far left of the image is Orion's head. The red nebula forming his head is the Lambda Orionis Ring (Sh2-264). Software Used Images Plus 4.5 for camera control, calibration, stacking, digital development, multiresolution sharpening, smoothing and noise reduction. Photoshop CS5 used for levels and curves, color correction, selective color, high pass filter, star shrinking, lab color, saturation adjustments, and screen mask invert. Gradient Xterminator for gradient removal. Carboni Tools for additional saturation adjustments, noise reduction, and smoothing. HLVG for additional color correction. Registar for alignment of stacks. Notes This is my first successful H-alpha combined image. I found it very tricky to combine the Ha data with the RGB, but eventually found a good technique that brought out the Ha while leaving natural looking colors. I would like to have had more time to capture additional Ha data, as the Ha was a bit grainy. Nonetheless, I'm still very happy with the final result, and its brought me a little more confidence in processing Hydrogen alpha images. This image was published by Astronomy Magazine as its Picture of the Day for December 27, 2012. This is my third Astronomy Magazine Picture of the Day! And, it ended up being my 25th Astronomy Magazine Picture of the Day, as they published it again on December 11, 2015! 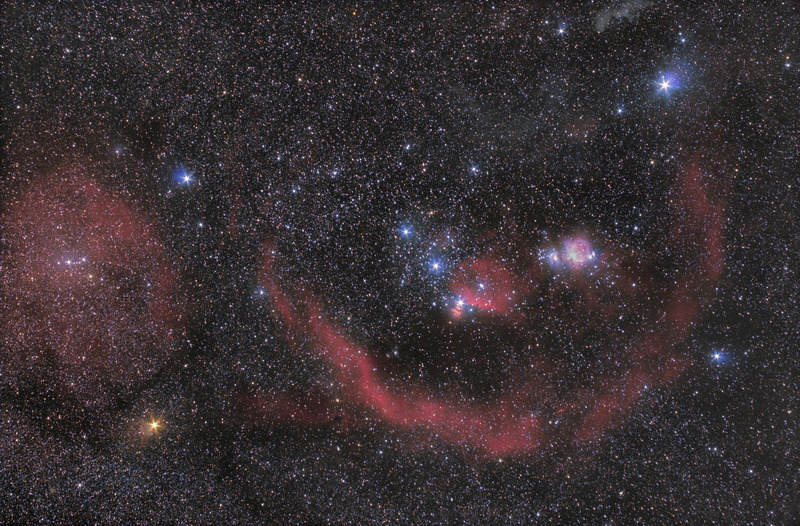 This image also won Cloudy Night's DSLR Image/Sketching contest for December 2012 and Astrophotogallery.org's widefield category for December 2012. This image was also published in the April 2017 issue of Sky and Telescope magazine in their article entitled "Herschel's Ghosts" (p. 31)!! !